The final Sunday concert for 2015 saw Newport Jazz Club members giving a warm Christmas return welcome to guitarist Nick Page. Since he moved to the island last year Nick, who had previously worked with many of the UK jazz greats including Don Rendell, Bill le Sage and Humphrey Lyttelton, has secured himself a firm fan base. Opening his set with "Falling in love with love" Nick was soon displaying his outstanding skills as an instrumentalist before he went on to show that he also has a voice reminiscent of early Chet Baker with his second number "Old rocking chair". The second set opened with a self penned number "Lost for words" which showed he is a more than accomplished writer as the number was a past finalist in the annual songwriter of the year competition. The rest of the set was a mixture of well known favourites together with one or two lesser known numbers. 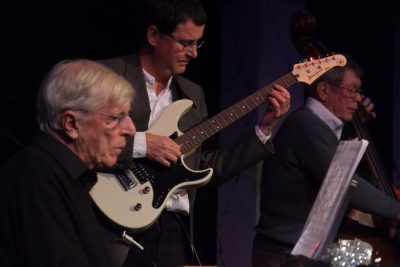 The special guest was "Relentless" Roger Mason who had a chance to display his tenor during a couple of numbers in the second set and back line support was provided by the Phoenix Jazz Trio. The concert closed in festive mood with "White Christmas" after which a retiring collection raised £82.77 for the Ellen MacArthur Cancer Trust.